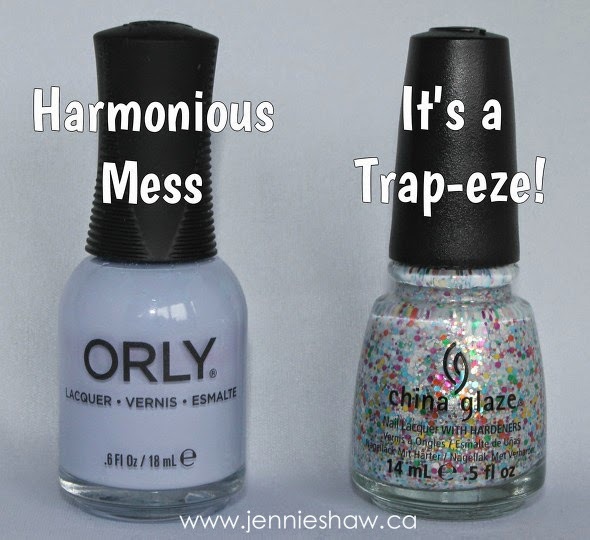 jennie's nails and tales: the nail files: two polishes + two coats = too cute! the nail files: two polishes + two coats = too cute! We're all busy. It's just the way it is. And sometimes, that busy-ness affects how much time we can spare to do our nails. But just because you've only got about half an hour doesn't mean that you can't still have a super cute mani. Trust me, grab a bottle of your favourite quick-dry top coat and scroll down to see what just two coats of polish can do. I stated with one coat of Harmonious Mess on each nail. Then, I did a second coat of Harmonious Mess on my pinky, pointer finger, and thumb, while on my middle and ring finger, I did one coat of It's A Trap-eze! After letting it dry for about five minutes, I topped each nail with a coat of quick-dry top coat, cleaned up my cuticles and was out the door, running to the post office before it closed for the day. The built-in sparkles and sheer pastel blue-y of It's a Trap-eze! means that not only do you get a fantastic array of sparkles, but also enough of a base that you only need one coat of colour underneath (please note that you TOTALLY need a base colour or it'll take at least three coats for an opaque look). In the past, I've used a baby blue base coat and I was delighted to see that the purple works just as well. And I'm totally being serious when I say that this entire mani, including dry time and clean up, was less than 30 minutes. Incredible, right? (Hint: the answer is yes! Haha!) I had kind of forgotten about It's a Trap-eze! and I'm surprised because it's such a fun and versatile polish! Funny how that works sometimes, eh? Can't wait to check out what you're sharing this week! Link up and show off! These two polishes go SO WELL together Jennie! GOOD EYE GIRL!